Situated next to the Highlands Reserve Golf Club, and just minutes from the excitement Orlando has to offer, Regal Palms Resort Orlando offers a centralized 24 hr guest reception, resort restaurant and bar, business center, sundry shop, games room, market place, spa and swimming pool area. 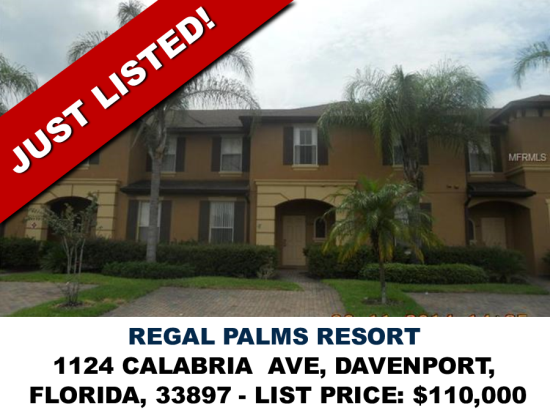 The Regal Palms Owners Association dues at $210.00/month in addition to basic common area maintenance and reserves also cover pest control treatments (4 interior and 4 building exterior per year through Terminix) and cable TV/WIFI internet access in each unit (200+ channels including HD channels). The club house fees are $315 a month.